The power of ideas is great. If we are to educate, persuade, and convert others to free-market thinking, we need to articulate, in structured form, the conceptual and moral foundations of free enterprise. We are obliged to expound a coherent and consistent body of principles that are in accord with reality and that properly reflect and explain capitalism. In other words, we must approach the idea of free enterprise from a philosophical point of view. The survival of free enterprise may be in jeopardy unless people understand its conceptual and moral foundations. Capitalism is a rational doctrine based on a clear understanding of man and society in which economics, politics, and morality (all parts of one inseparable truth) are found to be in harmony with one another. Capitalism as defined in this essay involves that set of economic arrangements that would exist in a society in which the state’s only function would be to prevent one person from using force or fraud against another person. 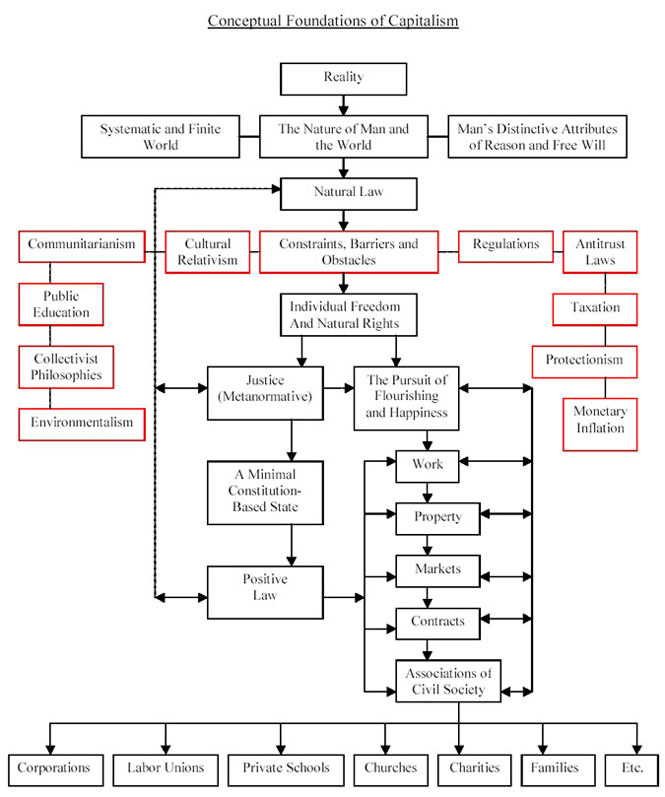 The following image provides an example model or diagram of the conceptual foundations of capitalism that are consistent with the nature of man and the world. The development of a conceptual framework is a natural endeavor that is undertaken in most areas that have claims to be called scientific or based on real world conditions. Frameworks for thinking about reality have long been the basis for organized knowledge. Constructing a set of ideas about real world objects, events, and occurrences would serve as a framework for a realistic political and economic system. Such a conceptual framework would provide at once both the reasoning underlying society’s rules and institutions and a standard by which they are judged. To construct a conceptual framework, we must be concerned with observed or experienced phenomena. Induction, generalization from perceptual experiences of reality, is used to form axioms, concepts, and constructs. The observational order and the conceptual order must correspond with one another if we are to conceive things properly. It is through the analysis of inductively derived ideas that the appropriate principles of society can be deduced. A correctly constructed internally consistent conceptual framework represents the real world in constructs and language. A conceptual framework should be logically consistent and based on reality so that inferences derived from it can be said to be deductively valid. From a deductive perspective, philosophy precedes and determines politics, which, in turn, precedes and determines economics. On the other hand, the philosopher must begin by inductively studying the fundamental nature of existence, of man, and of man’s relationship to existence. This is the point at which we will begin our review of the conceptual foundations of a free society. We live in a systematic universe with an underlying natural order that makes it so. There are discernible regularities pervading all of creation. There is an underlying order that gives circumscription, predictability, and their character to all things. Through the use of the mind, men can discover the nature of things, the laws that regulate or apply to them, the way they now exist, and the ways they can potentially be. To determine the nature of anything, it is necessary to remove all that is unique and exclusive to a thing and examine it in terms of the common characteristics it shares with all others of its type. Our goal is to discover the natural order as it applies to man and his affairs. There exists a natural law that reigns over the affairs of human conduct. Natural law theory holds that there is a law prior to man, society, and government. It is a law that must be abided by if each of these is to attain its true character and fulfillment. To ascertain man’s nature, we must, through a process of abstraction, remove all that is accidental to any specific man. What is left must be man’s distinctive features and potentialities. It is man’s ability to reason that separates him from other vital organisms. Man’s rational faculty distinguishes him from all other living species. Conceptualization (i.e., reason) is man’s unique and only proper way of dealing with the rest of the natural world. It is in man’s nature to use his rational powers, to form concepts, to integrate them, to evaluate alternatives, to make choices, and so on. In order to survive and flourish, men must come to terms with the requirements of reality. The ability to control one’s actions (i.e., natural liberty) is an inborn condition of man. In the nature of things no person can use the mind, senses, or appendages of another. Man is free to use his faculties provided that he does not harm others in his use of them. All thinking and acting is done by individual persons in their own spatiotemporal localities – a society cannot think nor act although men can choose to act in a coordinated manner with one another. Men have the ability to cooperate and achieve through voluntary action. The state of nature includes the suppositional circumstances that are assumed to have existed before the institution of a civil government. Because all persons are free and equal in the state of nature, it follows that no one person has the natural right to reign over any of the others. Society is natural to man as an associative being. It is within society that man can make voluntary exchanges that please and fulfill him. Furthermore, government is essential to enable each man to keep what is his and to live peacefully while having mutually beneficial voluntary relations with others. The state is not society. It is simply the entity charged with the function of protecting society that overflows the boundaries of the state. If a society was synonymous with the state, it would not be free because all human activity would be prescribed and governed by law. The ideas of social cooperation, spontaneous order, and progressive evolution of the social order are included within natural law. That which is appropriate for society is appropriate for human nature, and thus, according to natural law, if the law emerges and evolves spontaneously, then it has its roots in human nature and human intelligence. Social interactions and associations offer great benefits to individuals, including friendships, more information, specialization and the division of labor, greater productivity, a larger variety of goods and services, etc. Throughout history, economic activities have been the main type of social interaction and cooperation among people. Government thus became increasingly necessary as the range and complexity of market transactions grew. Of course, the existence of a natural order prior to government means that government’s role should be limited and restrained. Natural law theory limits government to its proper sphere, sets bounds to its actions, and subjects the government itself to the law. It follows that to circumscribe government to its proper role, power must be separated into its different functions and power must be counterbalanced to keep those who govern from exceeding their legitimate bounds. This is important because when those who govern act outside the law, they do so with the full coercive power of the government. Under the rule of law, everyone, including the government, is bound by rules. The idea that the government is under the law is a condition of the liberty of the people. The rule of law requires law to be general and abstract, known and certain, and equally applicable to all persons in any unknown number of future instances. A constitution is a law for governments. Constitutional governments are characterized by specific restraints and enumerations of their powers. The force behind constitutional governments is the idea of a higher natural law restricting the operations of the government. The notion of metanormative justice, an idea in harmony with natural law, is concerned only with the peaceful and orderly coordination of activities of any possible human being with any other in a social setting. This type of justice refers to equal treatment under social and legal conditions that include a collection of known rules regarding allowable and nonallowable actions that will lead to unequal positions with no one knowing in advance the particular result this arrangement will have for any specific person. On the other hand, normative justice, justice as a personal virtue, is concerned with exclusive (i.e., selective) relationships and requires practical reason and discernment of differences of both circumstances and persons. Similarly, the state can properly be said to be ensuring the common good when it protects man’s natural right to seek his own happiness. Only protected liberty (or self-directedness) can be said to be good for, and able to be possessed by, all persons simultaneously. No other definition of the common good can be in harmony with an ordered universe and the natural law. The common good properly understood is protected freedom that permits persons to pursue happiness or the good that each defines for himself. The government achieves the common good when its functions are limited to protecting the natural right to liberty and preserving peace and order. There is a critical distinction between the legitimacy of a right and the morality of exercising that right. The government should only be concerned with questions such as the domain of rights, the proper role of violence, and the definitions of aggression and criminality. The government should not be concerned with all personal moral principles. There is a huge difference between establishing the permissibility of an action and the goodness or morality of it. The state should be concerned with the rights of men and not with the oughts of men. Human nature is essentially unchanging and unchangeable. Men have always been imperfect in their knowledge, in their integrity, and in their ability to love and respect their fellowmen. Men possess all of the frailties of a finite nature. Accept them as they are and don’t expect human behavior to improve much over the long run. Men are essentially self-centered but conditions can be improved within that constraint by relying primarily on incentives (i.e., rewards and punishments) rather than on dispositions. Because of human limitations and imperfections, man’s ability to improve society is restricted. Social outcomes are mainly a function of incentives presented to individuals and of the conditions under which they interact in response to them. Given man’s moral and intellectual limitations and egocentricity, the fundamental challenge is to make the best of the possibilities within the constraints of man’s nature. Human beings cannot flourish unless they direct their own actions. Each man is ultimately responsible for what happens to him and has the potential to rise above influences of environment, heredity, and chance to alter and determine his own future. The task of human persons is to do well in their own lives. Men, by virtue of being human, possess the capacity to exercise free will and have the inalienable right to do so. The natural order can be altered by men using their reason and free will, but who can also choose to treat others rightly or wrongly. Natural law grounds the propriety of human actions and values in the facts of reality and human nature. There is a natural order, which would result in the consonance of everyone’s interests, if all people would participate in life fairly and justly. Whereas potential natural resources are the given, the variable is human action. Human beings are unique individuals as well as members of a distinct species. It follows that each singular person’s self-enhancement is a matter of what suits him best. Human variability in abilities and tastes is a source of comparative advantage that results in specialization, division of labor, and exchange. Similarly, the uneven distribution of natural resources, climate variability, and the diversity of human abilities lead to the ideas of the comparative advantage of nations and free trade. Variation leads to differential attainment in all areas of human endeavor and the dissimilar acquisition of income and wealth. Because the natural order of human society is variety, diversity, and inequality, virtue, charity, and compassion can only exist in a world of free and unequal individuals. In a free society, in accord with the natural order, natural differences among people would result in some being better off than others, but there would be no political inequality – everyone would be equal before the law and possess equal rights, freedom to choose, and equality of opportunity. Although environmental factors can mitigate or intensify mental and physical differences, nonequality will continue to be the natural order. Differences in individual talents, motivations, and resources that each of us has are not inherently unjust – there will always be inequalities among people. The idea of justice does not apply to the metaphysically given. It is not unjust for some people to be born with less ability or resources than others. Economic and social equality can only be attained at the cost of political equality, if it is possible to attain it all. Because people differ in intelligence, physical abilities, and drive, it follows that, given freedom; people will also vary in achievement, income, wealth, and status. People are unequal in reality. In fact, to say that persons are equal simply means that they are equal in one or more respects – not in all respects. Once freedom has been achieved, a man is free to do and act according to his plans and decisions. Of course, having the capacity to choose does not exempt him from the law of cause and effect. A man can choose to act in agreement or disagreement with natural law. However, once a choice has been made, the inviolate and inexorable workings of natural law and cause and effect come into play by supplying a reward or a penalty as a result of the choice made. A person cannot manifest real freedom unless he is willing to accept the natural consequences of his freely made choices. Personal flourishing requires the rational use of one’s talents, abilities, and virtues in the pursuit of one’s freely chosen goals. Happiness is the positive experience that accompanies or flows from the use of one’s individual human potentialities in the pursuit of one’s values and goals. In other words, personal flourishing leads to happiness. The right of private property is a precondition for making the pursuit of one’s flourishing and happiness possible. No more fundamental human right exists than the right to use and control one’s things, thoughts, and actions so as to manage one’s life as one sees fit. If one has the right to sustain his life, then he has the right to whatever he is able to produce with his own time and means. Each person has the right to do whatever he wants with his justly held property as long as in so doing he does not violate the rights of another. Without private ownership, voluntary free trade and competition would be impossible. As men found specialization desirable, an exchange mechanism evolved through which one person, who could produce an item more efficiently than others, could exchange it for an article that he could not make as efficiently as another person could make it. As trade and commerce developed, this giving-and-getting arrangement became more and more protected by formal contract. The idea of sanctity of contract is essential to a market economy and one of the most important elements that hold a civilized society together. A market economy is a voluntary association of property owners for the purpose of trading to their mutual advantage. The market accommodates people who seek to improve their circumstances by trading goods and services in a non-coercive setting. Markets are efficient and effective mechanisms for ensuring that society is arranged to maximize individuals’ ability to act on their best vision of their well-being. The market process reflects both social cooperation and voluntarism in human affairs. A market economy is a necessary condition for a free society. Private markets encourage people to interact, cooperate, learn, and prosper from their diversity. The market economy inspires people to seek out others who are different from them, treat their differences as opportunities, and garner mutual gains through their cooperative interaction. When two people make a deal, each one expects to gain from it. Each person has a different scale of values and a different frame of reference. The market mechanism permits people to maximize their results while economizing their efforts. Work is built into the human condition. Men have to work in order to sustain themselves. The things by which people live do not exist until someone creates them. Man survives by using his reason and other faculties to adjust his environment to himself. Productive work is also a means through which people attain purpose in their lives. Work is at the heart of a meaningful life and is essential for personal survival and flourishing. Work is necessary not only to obtain wealth but also to one’s purpose and self-esteem. There are integrated links between reality, reason, self-interest, productive work, goal attainment, personal flourishing, and happiness. There is an inextricable association between purposeful work and individual freedom. Both employees and employers are parties to a voluntary agreement, the terms of which both parties are legally and morally obliged to honor. Both seek to gain from the arrangement. As independent moral agents, the employee and employer agree to terms in a matter that affects their lives, their values, and their futures. A freely chosen job can be a source of one’s happiness and self-respect. Unlike the state, which is based on coercion, civil society is based on voluntary participation. Civil society consists of natural and voluntary associations such as families, private businesses, unions, churches, clubs, charities, etc. Civil society, a spontaneous order, consists of a network of associations built on the freedom of the individual to associate or not to associate. The voluntary communities and associations of civil society are valuable because human beings need to associate with others in order to flourish and achieve happiness. For example, freely given charity may be considered as an embodiment of one’s struggle for self-perfection. In this context, charitable activities may be viewed as fulfillment of one’s potential for cooperation and as a specific demonstration of that capacity – not as an obligation owed to others. Business is the way a free society arranges its economic activities. Business deals with the natural phenomena of scarcity, insatiability, and cost in a valuable and efficient manner. The business system creates equality of opportunity and rewards businessmen who take advantage of opportunities by anticipating consumer preferences and efficiently using resources to satisfy those preferences. Through his thought and action, the businessman enables other people to obtain what they want. The corporation occupies an important position within civil society. The corporation is a social invention with the purpose of providing goods and services in order to make profits for its owners, with fiduciary care for shareholders’ invested capital. Corporate managers thus have the duty to use the stockholders’ money for expressly authorized purposes that can run from the pursuit of profit to the use of resources for social purposes. Managers have a contractual and moral responsibility to fulfill the wishes of the shareholders and, therefore, do not have the right to spend the owners’ money in ways that have not been approved by the stockholders, no matter what social benefits may accrue by doing so. Unionism currently consists of both voluntary and coercive elements. Voluntary unions restrict themselves to activities such as mass walkouts and boycotts. They do nothing to violate the rights of others by using violence against them. Coercive unions use physical force (e.g., picketing when its purpose is to coerce and physically prevent others from crossing the picket line and from dealing with the struck employer) aimed at nonaggressing individuals. Mass picketing that obstructs entrance or exit is invasive of the employer’s property rights as are sit-down strikes and sit-ins that coercively occupy the property of the employer. People who are willing to work for a struck employer have a legitimate right (but currently not a legal right in many states) to do so. In addition, the struck employer has a legitimate right to engage in voluntary exchanges with customers, suppliers, and other workers. In a free society, one based on natural law principles, each person would be free to take the best offer that he gets. In a free society, unions could merely be voluntary groups trying to advance their members’ interests without the benefit of special privileges. In such a society, some workers would join one union, some would join other unions, and some would choose to deal with the employer directly and individually. There are a great many coercive challenges, encroachments, and constraints that have inhibited the establishment of a society based on the natural liberty of the individual and the realities of the human condition. By nature, these barriers tend to be philosophical, economic, and political. Some of the strongest attacks on, and impediments to, a free society include: collectivist philosophies, cultural relativism, communitarianism, environmentalism, public education, taxation, protectionism, antitrust laws, government regulation, and monetary inflation. These bureaucratic and socialistic ideologies and schemes tend to stem from various sources such as true human compassion, envy, the insecurity of people who want protection from life’s uncertainties, categorical “solutions” proposed to solve problems, idealism, and the tendency to think only of intended, primary, and immediate results while ignoring unintended, ancillary, and long-term ones. The survival and flourishing of capitalism depends upon concepts and moral values that provide the foundations upon which a capitalistic society is constructed. In a world of change, the viability of the market economy is at stake unless those who live and participate within it possess a rational understanding and appreciation of its underlying concepts and values. Present and future participants in the business system need to have access to a “bank” of fundamental ideas that provide the groundwork for the free enterprise system – a conceptual framework would provide such a bank. How do we go from our current interventionist political and economic system to a society of laissez-faire capitalism? We cannot just wait for the state to wither away. We must disseminate the principles and theories of the freedom philosophy and promote the values of the free enterprise system in understandable, nontechnical terms. We need to achieve a revolutionary shift of conventional wisdom. We need to point out the theoretical and systemic errors of statism and the growing anomalies in reality where the welfare-state paradigm just does not work. Having an objective conceptual framework for capitalism based on reality communicates to others that we advocates of the free market are not arbitrarily trying to impose our own personally biased political views on others. Rather, we are simply asserting what is true and real. A proper conceptual framework presents an integrated view of existence formed by a conscious and rational thought process and logical deliberation. Only a free society is compatible with the true nature of man and the world. Capitalism works because it is accordance with reality. Capitalism is the only moral social system because it protects a man’s mind, his primary means of survival and flourishing. Truth and morality are on our side. Let us hasten the demise of statism and the establishment of a free society by working individually and in concert with others to educate, persuade, and convert people to a just and proper political and economic order that is a true reflection of the nature of man and the world properly understood.